Director Denise Devin unleashes a dark, bold and emotional re-imagining of Shakespeare’s bloody masterpiece on the ZJU stage, April 24 – May 31. It is a fresh, new, fearless vision of this relentless classic as only Zombie Joe’s Underground Theatre Group can present. The shows stars Amir Khalighi as Macbeth and Melissa Kite as Lady Macbeth, and features the Fearless Macbeth cast: Jason Britt (Macduff), Arielle Davidsohn (Witch), Brian Felsen (Banquo), Hillary Freedman (Lady Macduff, Seyton, Donalbain), Jenny Gustavsson (Witch), Mark Hein (Duncan, Porter, Murderer), Chandler Hudson (Malcolm), Jonica Patella (Ross), Angela Robitaille (Witch). The creative team includes Kevin Vancott (original music commissioned for the production) and Amy Volker (technical assistance). The show is produced by Zombie Joe. 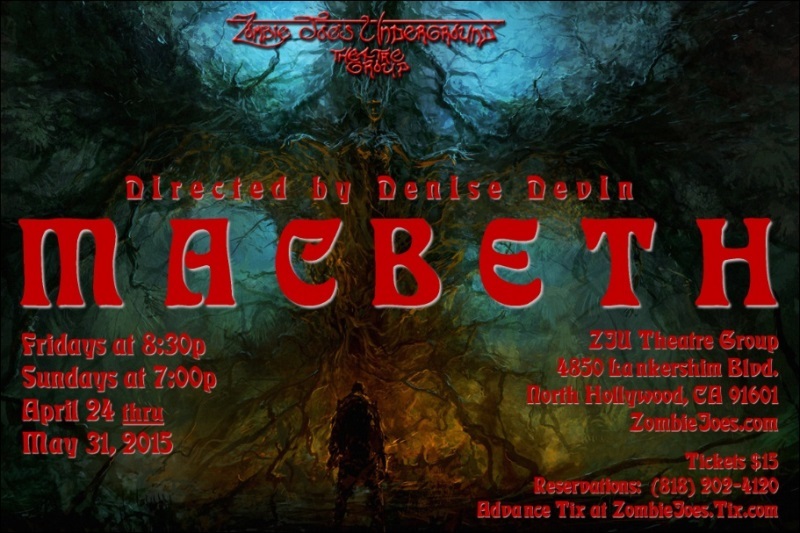 Macbeth runs Fridays at 8:30 pm and Sunday at 7:00 pm at ZJU Theatre Group, 4850 Lankershim Blvd., North Hollywood, CA 91601. Tickets are only $15. For reservations call (818) 202-4120 or go to ZombieJoes.Tix.com. For more information visit www.ZombieJoes.com.